Are you looking to secure a sizeable loan? A back end debt-to-income ration (DTI) of more than 40% could prevent you from achieving this goal. With this helpful calculator, you can quickly learn your frontend & backend DTI and discover if you’ve got a good chance of being approved for a loan. First enter the appropriate information in the fields provided. This includes not only your income, but also all of the debt payments you may be making as well. As you enter your details the calculator automatically updates. You’ll quickly learn your total income, your total monthly payments, and both your front & back debt-to-income ratios. If your DTI is particularly high, try changing the information in the calculator fields to see what changes you’ll need to make to improve your DTI. Paying off obligations with a high monthly payment can free up space quickly while augmenting your income with a side gig or asking for a raise can also help you both pay down debt quicker and have a higher income level to qualify for a larger loan. Some lenders have lifted the historical 28/36 ratios significantly to compensate for the increasing student loan debt carried by many millenials. We all know that credit scores play a significant role in financial wellness. However, there is another score you may be unaware of which plays just as big of a role - debt to income ratio. This ratio helps one understand their true financial picture. With a simple calculation, this number can be revealed, leading to better mortgages, car loans, and credit card rates. This ratio acts as a representation of cash flow and shows how much you owe compared to how much you earn. DTI is the percentage of monthly gross income that goes towards paying fixed expenses, such as debts, taxes, fees, and insurance premiums. When understanding DTI, there are two primary types most often used: front-end ratio and back-end ratio. Front-End Ratio: this ratio is the percentage of income for housing expenses. For renters, this percentage is represented by monthly rent. For homeowners, this percentage of income applies to mortgage principal, interest, and insurance premium; property taxes; hazard insurance; and homeowners' association fees. Typically, the front-end ratio should not exceed 28 percent of monthly gross income. Back-End Ratio: this ratio is the percentage of income for paying your reoccurring debt. These debt payments could include credit card bills, car loans, student loans, personal loans, child support or alimony payments, legal judgments, and any other fixed expenses. The back-end ratio should not exceed 36 percent of total gross income. The notion x/y expresses DTI, where x equals front-end debt to income ratio, and y is equal to the back-end debt to income ratio. The first step in getting DTI is knowing monthly income. Monthly income is calculated by taking yearly gross income and dividing by 12. Now, front-end ratio can be calculated. Take monthly income and multiply it by the first number in the lenders required ratio. This number shows how much monthly gross income is allowed for housing expense. Then, multiply monthly gross income by the second number in the lenders required ratio. This determines the total amount allowed for all housing expenses and debts. For example, let's say that the lender requires a 28/36 ratio with a yearly gross income of $70,000. Monthly gross income is calculated by $70,000 divided by 12, which equals $5,833. Front-end ratio is $5,833 multiplied by 0.28, which equals $1,633.24. Back-end ratio is $5,833 multiplied by 0.36, which is $2,099.88. From here, $2,099.88 minus $1,633.24 is $466.64, making that the monthly allotment to cover fixed expenses. Typically, conventional mortgage lenders do not allow for high amounts of reoccurring debt (above 36 percent) as that is considered a slippery slope. Do not lose hope as lenders may still loan out but at a higher interest rate or stricter terms and conditions. Federally subsidized loan programs like FHA loans & VA loans are also typically more lenient with allowing higher debt loads. The debt to income ratio is a number that lenders use to decide the qualifications of someone wanting a loan. This ratio allows banks and lenders to decide how much their customers can afford before having financial difficulties, helping them set lending amounts. While certain factors, such as credit score and length of time at a job, come into play while applying for a loan, a good DTI ratio provides leverage, especially if the other factors aren't in your favor. The financially stronger, the better, and a low DTI ratio creates a very strong case. Remember, credit scores only show payment history and do not encompass income. One can have a high credit score and low DTI ratio or conversely, low income and high DTI ratio which is why lenders look at both credit scores and DTI. To ensure solid ground, try to keep DTI ratio to 30 percent or less, especially since there are other financial obligations, such as groceries, entertainment, and utilities, to consider. While cutting DTI can be a challenging task, since finding ways to increase income or reduce spending and debt can be challenging, there are tactics to address this issue. Cut costs: Look for areas within your budget to cost-cut. Once done, put saved money towards higher-interest loans and debt. Double up on credit cards: Double up on minimum payments to decrease debt faster. On loans, pay more per month if there is no penalty for prepayments. 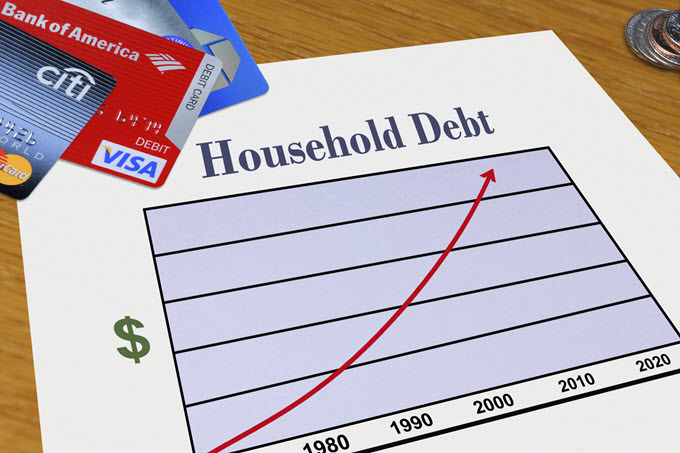 Stop charging: Buy in cash or using checks to prevent more credit card debt. Build an emergency fund: Build up a fund to help pay off any emergency costs or even to help pay for a vacation, so you don't resort to credit cards. Avoid major purchases: Try not to overextend. Hold off on bigger purchases until you are more financially stable. Consider getting help: If you are still having trouble, the assistance of a financial advisor can help put you back on track. This debt to income ratio is important, as it is an indicating factor of how much of your income is spoken for each month. These fixed payments decide whether there is enough cash flow to meet all monthly financial obligations. In general, the lower the debt to income ratio, the better the cash flow and a higher chance that loans will be repaid. Also, the lower the debt to income ratio is, the easier it will be to qualify for credit for future major purchases. With a better understanding of debt to income ratio, it is also important to keep in mind that a loan should not be taken just because you qualify. Before deciding on a big buy, write down all debt, income, miscellaneous expenses, and future needs and wants. These factors, unknown to the lender, can change your DTI ratio in the near future, thus potentially causing financial trouble. Knowledge of your personal debt to income ratio will help to ensure the affordability of debt repayments, as well as providing peace of mind when properly handling financial responsibilities.